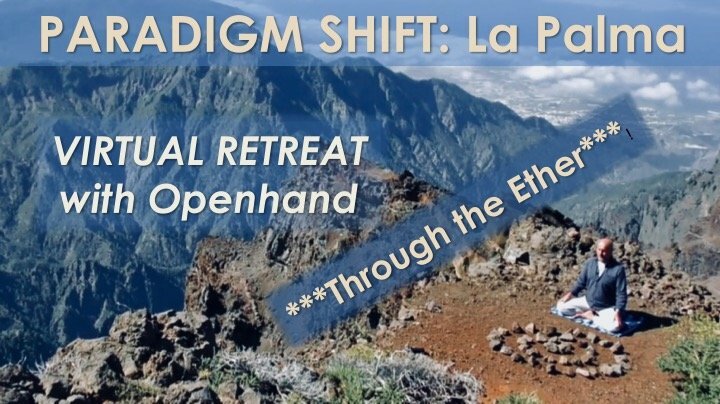 Openhand Virtual La Palma Retreat 2019 - Through the Ether! The Distance Just Melts Away! The New Year group have now arrived on La Palma and are acclimatising for the retreat with the work beginning Monday 21st. Since Openhand has a wide and diverse community, spread to the four corners of the globe, it's always wonderful to feel people tuning in virtually, "through the ether". It usually works incredibly well, because when we tune in and feel it, the distance simply melts away. What really helps is the high vibration location of the Island, which is Volcanic, far from the "Madding Crowd", and is perfect for opening higher dimensional portals - the veils across reality are thin. There will be a Super Blood Wolf Moon with a total lunar eclipse to commence everything tonight, so meditations are taking place around the world. Some are predicting it to be a generally highly activational period. So the Universe picked the right timing! What will Joining the Retreat Involve? I invite you to tune in a couple of times aday (three if possible).... in the morning, early afternoon and evening. If you only have a short while each time, that's fine. If you're working during the week, then just taking a 5 minute pause to tune in will still have a highly beneficial effect. Follow the suggested meditations and subjects of inquiry. Then when you get a moment, post here in this Journal what you're expriencing. I'll glad offer a higher dimensional intuitive reflection. See you all in the ether! I'm very much looking forwards to it. 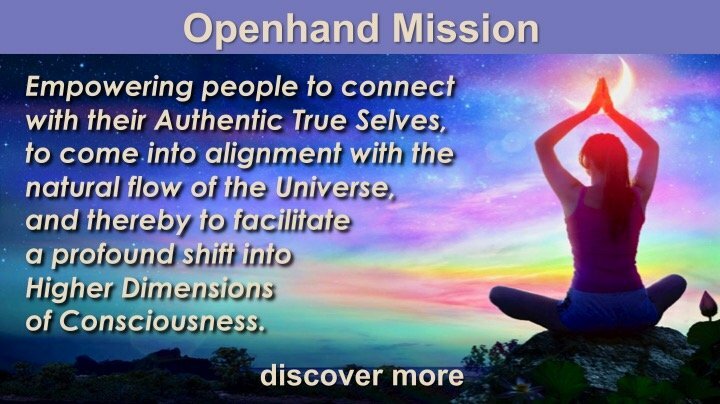 Hi Everyone out there in the Openhand Virtual Community. It's a great time to be tuning in this week - the veils are thin out here on the Volcanic Island of La Palma - so I felt to freely open the space and have you tune in. I'll be suggesting daily meditations and then invite you to share the inquiries that you've got coming up. I'll tune in and offer some intuitive guidance - a great opportunity and a very special Blood Wolf Moon to kick it all off! I do have the sense that we'll see some ripples around the planet this week. See you in the ether. Do let me know here below if you intend to tune in. We can commence the bridge! Hello to all you beautiful sparks of being.... I'll be joining you from my cold home in Wisconsin. I’ll be tuning in, looking forward to it!! Virtual retreat - absolute pleasure having you all on board! Wonderful! What a lovely response and a pleasant surprise - I took the group out today up to the top of the Volcano, connecting with "Isla Bonita" - the soul of the island and creating a portal of connection for us to work within. I'll begin the day tomorrow with some suggested meditations and inquiry - let's see how it all unfolds. It's an absolute pleasure having you all on board. And tomorrow is the eclipse and full wolf blood moon - sure to be highly activational. Joining! Would love to explore with you all. Looking forward to whatever the week brings. Okay everyone, our 'Virtual Retreaters', so nice to see and feel you in the ether. The moon was strong last night, did you feel it? For me it moved the emotional body quite strongly, and there were lots of feelings of the "Pain of Existence" - why are we here, why are we doing all this, what's the point? Who was feeling this? - I can imagine plenty of you do from time to time. But the Universe has an underlying point - if you look at what it's doing, it's bringing light into the darkness. And at a soul level, you are that expression of light. 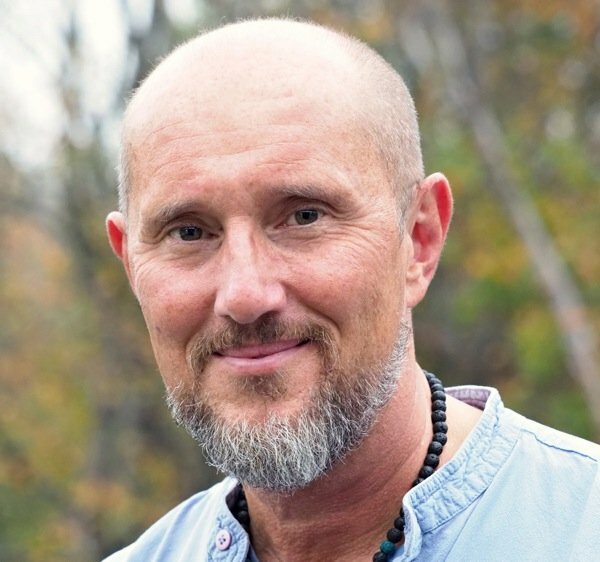 So if you're connected to the source within, and flowing with it, then in your authenticity, you will most likely have that yearning to express the light - which is probably why you're here also in this retreat. With the Full Blood Moon, I didn't subscribe at all to the widespread idea that it was some kind of Ascension portal - especially if it's blocking out the sun and pulling on the emotional body. My sense of it was that it was more activational of inner density (which has happened to people here on the retreat already). I felt a lot of grey energy around, fleets of Orions, looking to realign and leave this place, which actually of course is a great sign. So up on the Volcano yesterday, that's what our portal was initiating. It was quite heftly energetic work though, because of the configuration of the moon, and what I sense is, that as the moon now wanes, the strength of the ascending shifts of energy will greatly increase. Toward the end of the week, it will likely feel like a huge lift. I would encourage you all to process the density first though - see it as an opportunity to work through anything that might be holding you. Where Grey energy might be appearing in your field, (you can read about the Orions and who they are here... Liberation of the Orions...Dealing with "Grey" Energy in Your Field) you'll notice it by the sense of a feeling of depression, hopelessness and pointlessness. If you recognise that, it can greatly help to realise... IT IS NOT YOU! Often it can be entities and their energy in and around your field. But if you are feeling that way, it is likely because you might have a degree of this questioning yourself. I put it to you that as you keep aligning with the light in you, as you strengthen the reconnection to the source, this energy will ultimately leave you. We will experience that this week for sure. What I suggest you do to begin then, if you have any of this energy in your field, just relax and soften inside, know your inviolable connection to the source, know that you are surrounded and supported by the angels. And that as you realign, then you encourage any depressive Grey energy around you to do the same. Your invitation above and the quote you posted has catalysed a powerful emotional reaction in me. I’ve pretty much always felt I didn’t belong in the 3D world, and I’ve come to terms with that, but this is the very first time I’m suddenly feeling like I don’t belong or am not welcome in a spiritual higher dimensional context. The feeling is so strong, there is actually a part of me that wants to resist ‘tuning in’, because on a deep deep level it doesn’t feel worthy of the acceptance and encouragement of this community. It’s actually fighting teeth and nails right now to have me run and hide and NOT write this. Fortunately, I know where this stems from. Lately, a lot of emotional memories from the explosion of SIRIUS have been emerging for me and just a couple of days ago, my own ‘failure’ as a soul presented itself to me as a deep realisation that has left me gut-wrenched and faint-hearted for the past three days. How easily manipulated I am - betraying my own, for a lesser substitute and a false sense of belonging. But the weakness is that strong it overpowers me again and again, until it seems the only reasonable option. I have spent lifetimes since trying to compensate for this weakness by proving my strength, my bravery, my steadfastness, commitment and LOYALTY over and over. Feeling inferior to the ones in my family who made it back, who passed the test that I ‘failed’. Feeling guilty for my betrayal, my loss of trust in them and the Universe. I’ve also repeatedly outcast and alienated myself as ‘punishment’ for this flaw. Having gone through some really intense deep and dark processing in the past few weeks, I have steadily made my way back to this moment - when my overzealous, ‘overheated’ Ray 1 finally crumbled into a young heart’s cowardly capitulation based on immaturity and fear. The Wizard of Oz in all her glory. Funny synchronicity; I actually live in a Yellow Brick house. for someone on the other side to open the door and invite me in. How would it make me feel to finally have to receive and accept unconditional Love? So here I am, finally, after lifetimes of journeying lost, isolated, overcompensating for my weakness by pushing and shoving my way through, outcasting myself to the side-lines of existence. Denying myself the family that is my divine birth right because I couldn’t accept my own failure. Will you open the door for me? Will you let me in and tell me that I’m welcome back? Will you embrace me as one of your own, and tell me that I belong and that you missed me? What a powerful story, your honesty and exploration brought me to tears. I’m drawn to give you a big hug through the ether and tell you that you are home. You are accepted. We are your soul family and you are welcome and accepted here, exactly as you are. Much love and big hugs! I just felt to tune in during the lunch break here. Powerful sharing indeed Anastasia, my heart goes out to you - the Sirius Ascension 120 million years ago is coming up here too - so this evening, I'll share a perspective on it which will likely be having an impact on your experience. I highly believe that the Blood Wolf Full Moon will have kicked things off like this for people. 1. What is motivating you right now? as in what is engaging you in your relationships, jobs and general living circumstances? What's driving your experiences, and what are the underlying desires? (that may either be aligned or misaligned). 2. What blockages are coming up? so when you look at all aspects of your life, specifically what disharmony are you experiencing? (which will be coming from an inner blockage manifesting into the outer circumstances). 3. What is your Orientation in LIfe? In other words, what do you perceive is your underlying sense of purpose guiding your life? Work to be as honest, authentic and real as possible. What you're experiencing doesn't have to align with what you think your motivations ought to be! What is motivating you right now? as in what is engaging you in your relationships, jobs and general living circumstances? My motivation is to open my heart and to allow my authentic self to come forward and express. I’ve joined a Buddhist mindfulness center in order to surround myself with positive influences and like minded souls. I’m in communication with my guides and higher self and as my general living circumstances are transforming, I’m allowimg them to guide me as I navigate the transitions in my life. My biggest blockages currently are fear and regret. Fear of giving up my current apartment before I’ve found a new one. Especially with the extra challenges of having a large dog and impaired credit. I keep asking my guides and higher self for guidance and they tell me I’ll be taken care of and to have trust. So I’m handing in my notice today, placing my faith in the universe that I will be taken care of. The regret comes from crossing paths this past weekend with someone from my past. The regret of what could’ve been comes from not speaking up 20 years ago at her wedding when her grandmother told me she was in love with me from the time we were kids. I was already married and had a child, but a part of my soul was shattered right then when she told me. Those feelings of regret came pouring back this past weekend. She’s still happily married and still doesn’t know what happened. I know I had to walk the path I did in order to pay a karmic debt from past lives, but it’s hard not to think about what could’ve been. 3. What is your Orientation in LIfe? In other words, what is your underlying purpose? My underlying purpose is to be my authentic self and to help others awaken. I find myself finding my voice and reaching out to others to help them on their journey. I know all of the changes I’m going through right now will help me better express myself to others. Looking forward to your reflections. I have been feeling demotivated and pointlessness for the last week or ten days . In response I am on Day 6 of a deep cleanse ,a digestive reset of sorts that brings some purpose to my every day . Funnily enough I was drawn to a.sign that said 'astral pipes'. I have been feeling very strong crown chakra sensations . Also a violent dislike of sugar . It's very interesting because I am feeling the energy of this moon just as you describe - a shifting of inner density . This coincides with my brother having a psychotic episode with suicidal and homicidal ideation and strangely enough with me holding empathic space for a man as he comes to terms with having a boy with Downs syndrome( on the same day ) . I saw mirror number saying how my brothers illness mirrors what's going on in society which is seemingly increasingly insane . As far as the Sirius connection is concerned the fact that Downs is a chromosomal anamoly really spiked in my consciousness. Seems connected ,I don't know how. I took time to lay on the floor for about 30 minutes last night in my living room, which has a skylite through the roof so, I had a spectacular view of the Blood Wolf Full Moon . I felt waves of energy move down from the solar plexus to the coccyx. I waited with that feeling until it took on a gentleness, then I went to bed, but did not rest for a few hours. 1. What is motivating you right now? I am motivated by a sense of awareness of purpose. I have been guided to the people situations & tools that I know are helping me align with my soul, but have trouble with "a perceived proper implementation" of movement forward. It's too fast; too slow; not right. I don't know what I'm doing. I ask "show me". The response seems to be to maintain a passivity, though I don't know why. So, I sit with my passivity - like a lump of coal for Christmas. Doesn't seem too exciting. 2. What blockages are coming up? Impatience of and acceptance of the unfolding of my journey in it's own time. I feel as if I should bask in the steps of the process, but find that difficult. Joy does not spew easily. Recently during a family squabble, I took the time amidst the exchange to feel where in my body was I responding. I felt my heart constrict a bit which I was able to soften. I also felt tightness in the sacrum & at this point, I wasn't much engaged in the squabble as much as I was noticing and quieting my bodily responses to the energy in the room. It's not that I didn't care about the issue, but to engage in an argument just doesn't appeal to me. Sometimes I think I'm just done or too tired to bother with it. I do feel a bit of guilt at times because I just don't care at that particular level any longer. 3. What is your Orientation in LIfe? I feel a sense of wanting to work directly with people to assist in their self healing and wellness journey. I have been very active in networking and learning where to find an outlet for this endeavor. I am amidst creating a website to allow for people to contact me regarding herbalism and energy facilitation or any combination of both. All the while trying to maintain a home, 2 teenagers and a corporate job. I struggle a bit with the self care aspects, but have found some success with setting daily reminders that pop up and nudge me to "hold space". That small reminder instantly helps me re-calibrate on the spot and hold space for myself, others, the planet, the ether. I am more mindful because of it. I feel this is part of how to transition out of my corporate job, and the empty nest I will soon have. Thanks to everyone for sharing and holding space. Wow - lots moving here. We just completed the first day and essentially I had people exploring in relation to those three questions. What we're working to do in the Openhand Approach here, is to start to highlight the shadow self and unpack it. Imagine the soul being fragmented into internal density, which will have caused pain and tightness, physically, emotionally mentally. For example feeling like you don't belong here, or who you are is not truly valued. So what happens is that the being tries to placate the pain - do things to cover over it. Seeking attention as a replacement for love, friendship as a replacement for sense of isolation. Progressively you build a false life that is always doing things to contain, placate or subdue the pain of the false self - that's how society is built. It temporarily distracts from this pain through distraction or deferral rather than dealing with it. So the way to unravel this, is to acknowledge it and then freely express it. You locate where it is within your being - where the contraction is and deeply express it. Making a sound that expresses it for example, or a movement, or viusalising it's colour and form. By becoming deeply intimate with it, expressing it and then totally accepting it, to the degree you don't need it to go away, starts to dig up the roots of the attachment. As you become present in it, then the fragment of soul that was stuck there starts to reintegrate and the density unwinds. At the time of the incident, you were only ready to make the choice you made. You couldn't have done it any other way (even though there might have been other possibilities). Your inner configuration of consciousness creates the exact reflective conditions to experience that choice. And if it didn't happen in those circumstances, then you would have created different ones to express the same choice. You didn't come here to make choices. They were already always going to happen. You came here to figure out WHY you made the choice you did. In understanding the dynamic that makes the choice, you get to realise what outcome it was you thought you needed. Maybe for example (Scott) you associated an unattainable person with your Twin Flame. They were always going to be inattainable because you needed that to realise they are merely a reflection to find your own completeness within? So your soul made them purposefully unavailable. If this resonates, accept it, then visualise the person, but feel the energy they represent already within you. This will help dissolve the attachment and the sense of regret. Hi Megha - with pointlessness, again, regress into the situations that activated the feeling and let yourself fully express pointlessness. The Universe sprang into being without intention. If there was intention, there would have to have been a being to have that. And where did this being come from? You can postulate the entirety of the Universe from the infinite potential of pure presence. But assuming there was no 'mind of God' that created it all, then there was no intention, there was no 'point'. When you come deeply into presence, you find you can accept the Universe to the degree that there is no point to it. It just is. I suggest working into pointlessness to accept this. Paradoxically, when you really touch this space, then you're in the infinite potential, where anything can now happen. Be in the pointlessness until you completely accept it. Then let your intuition put on a piece of music that wants you to emerge from the pointlessness and simply express. Let free flowing action emerge. have trouble with "a perceived proper implementation" of movement forward. It's too fast; too slow; not right. I don't know what I'm doing. I ask "show me". The response seems to be to maintain a passivity, though I don't know why. So, I sit with my passivity - like a lump of coal for Christmas. Doesn't seem too exciting. Who needs it to be exciting? The One in you (who you really are) doesn't need anything to be exciting. The One in you could sit for an eternity in stillness. Yet, when you touch the deep presence of not needing anything, then something can arise. But it's essential not to then control this, or else the expression will cease to be authentic. So soften into the acceptance of 'not exciting'. So you could be in that for an eternity. Make the time to literally sit for an hour or so, breaking through any boredom or need for it to be a certain way. Touch the deep emptiness inside - you'll likely have to break through plenty of layers to access this. See how you get on with that folks! Great to have you along for the ride. 120 million years ago, there were communities on planets of the constellation Sirius very similar to those on Earth. Nibiru was just such a planet around Sirius C. The inhabitants had learned how to manipulate "Free" energy but didn't realise the disatrous impact this had on the configuration of matter (nothing is free!). It made the system unstable. It was a part of the reason the consciousness of Sirius B began to shift, before exploding through a White Dwarf Ascension. This obliterated the communities in the constellation and especially around Sirius C. Many carry the karma of that. Some would feel like the very air within their lungs simply diappeared as the molecular structure broke down. It's one reason humanity manifested the gas chambers of the Second World War to recreate this karmic experience. And as the physical matter tore apart, then people were literally torn apart too. Many of the population then, as souls, experienced being 'cast adrift' in space, 'abandoned by God'. And it took some considerable time to reclaim them back to the light. It's also where others went onto the shadow side, disconnected from the usual cycle of reincarnation and became "Opposing Consciousness" - configuring reality to their own specific (distorted) agenda - which becamse to re-engineer the society and genetics they lost - this especially happened with the ruling elite - the Annunaki (Siritus C is known as "Anu"). It has been the Annunaki who've led the Intervention on Earth and have been responsible for establishing the synthetic reality here, dating back to the time of Atlantis some 250,000 years ago. There was a whole team of lightworkers dispatched to the system in advance of this - I was one of them and can recall the sense of the experiences very clearly. We knew that some powerful breakdown was going to happen. We knew the way forwards was Ascension. But either our messages went unheaded or were misunderstood. To many, what transpired would have felt like abject failure. I know that's something I've had to deal with personally. Unusally on this Openhand Retreat, the group size is half what it would usually be. I know that I manifested this, because of a latent filtering that would have preferred to 'save' a lager number. The Blood Moon and the retreat here remanifested those experiences so I could recalibrate in them. The Sirius circumstances were indeed very traumatic. And many carry them with them today. They will come up in a big way. In fact it is my knowing that the shattering of the population of Syria here in the Middle East is also a karmic reflection of what took place. The recent Bladerunner Film brings up a lot of the Sirius feelings for me. I often play it in groups to stimulate that karma. If you feel like it might be relevant to you, take yourself into your own space, turn off the lights, play the video below and express to the music. Or find some music that aggitates that sense in you and move to it. Let it come up. And then crucially, accept it and let yourself emerge from it. What music then do you feel to play to help to soul integrate and emerge? Maybe something like the Gayatri Mantra will help you softly emerge from that? Do share your Sirius experiences and karma with me if you feel you have them. I used to have bronchitis, a respiratory desease, for some 40 years of my life. Now it's almost completely gone - but I've always had an intuititon that it was of karmic nature. In your view, Open, can it be connected to the Sirius karma? What Anastasia's sharing triggered with me is a deep sense of Worthlessness . Also ,on Sirius ,not only was I not heard ,I was actually persecuted .In my current life it plays out as a conflict. I purposefully ' hide my light' because I am subconsciously afraid of showing who I truly am for fear of a backlash. Even in my marriage ,there is an element of pretending to be normal rather than rocking the boat ,the security for my daughter and myself that it represents. There are many threads to this. I believe it's an experience I have replayed again and again especially in female human form. What is motivating me right now : Is. Deep desire to be authentic ,vulnerable to each moment as it arises . General Orientation : Underlying purpose seems to be to be as much of myself as is possible. As I work through layers ,that seems to entail a much deeper sense of purpose and freedom than I ever thought possible . Hi Mark - yes, all kinds of respiritory issues and problems can relate back to Sirius Karma - my intuition tells me that was the case with you. Today in La Palma, we'll be working specifically on bringing the Shadow side - the False Self - to the surface so as to feel it as an energy that it may be unwound and released. I invite all on the virtual retreat to work in a similar way. It the Openhand Approach, what we observe, is that the soul gets fragmented as it comes into density through the inner layers. So for example it will fragment in the fourth density due to karma (Sirius for example); in the 3rd density at the level of the intellect, perhaps due to inner child conditioning by parents and school; in the second density, the emotional plane, perhaps due to the breakdown of some relationships - when you first fell in love for example but the relationship boke down; or in the 1st density, the physical plane, due to physical challenges you might have had - illness, injury, or abuse, including sexual. In these such circumstances, where the soul is not 'realising of The One', in other words, where it 'forgets' its inviolable connection to the One, then that's where it can identify with the circumstances of reality and fragment into it. You then form attachments and eddy currents of energy build around these anchors. This in turn causes some degree of pain and tightness, which society then tries to 'cure' by taking the pain away - something to consume or distract with. These eddy currents of conditioning and the behaviourisms that then arise from them become the "False Self", the ego - essentially the identity that most people live within. What we need to do is to separate out the shadow side false self, so it can be seen and felt. We work to reclaim nuggets of 'soul gold', fragments caught in the bed of the river of life. We can call it 'soul retrieval'. We'll be applying something like the Openhand Breakthrough Breathing, which you can download here... Openhand Breakthrough Breathing Technique Then using the breath, you start to feel the energy body of the False Self and also experiences of the soul. The False Self will be felt as tightness, discomfort and nausea. The Soul and the True Self as a feeling of 'rightness', expansiveness, timelessness, interconnectivity, surrender and peace, also will, courage and strength. Now feel into the density of the shadow side False Self. Touch the tightness of the energy inside. Then animate it. Meaning to visualise it - what does it look like? Is it organic, metallic, what colour is it? What does it smell like? Then start to express it in sound - make the sound that eminates from it - sing, shout, speak it out into your environment. Then express it through a position or movement. So you might adopt the foetal position for example, bury your head in a cushion, and then start to move with it. Put on some music which captures the sense of feeling of the shadow side. When the shadow side is now fully active, soften right into it. Surrender and accept it to the degree you don't need it to go away. This is what I'll be encouraging in the guidance. Once you've accepted it so much that you don't need it to go away, paradoxically, you're already reaching the point where you are free of the attachment. At this point, it's like you open a doorway through the experience and become simply present with it - you are becoming the Presence of the One - that which you truly are. At this point, you can start to unwind the energy of the False Self that you've uncovered. You could use deep breathing for this, powerful movement to music, The Openhand Bow, a strong walk in nature, energetic dance. A sauna would likely help - which is what we'll be doing here too. Feel the old energy unwinding and leaving you. Finally, start to touch and feel the sense of new energy wanting to come through - the fragment of soul which has been released. How does it now want to express differently? Perhaps it is more surrendered, perhaps more expressive and courageous. Especially watch for the synchronicities that start to reflect in your environment about how to express as your True Self. Then you'll start to integrate the new aspect of self. Wishing you all well with that. Do ask any questions that come up and share your experiences. I'll happily offer reflections. Megha's exploration has really struck a chord with me. And particularly what Open said in response: Also not being heard in family - a big one. Many lightworkers with a different orientation to Sirius incarnated there in families, so would have felt quite odd and out of place. I have for a long time felt like I'm both not being heard and also not understood. There's a lot of misinterpreting what I say from adults in my family and the kids just outright ignore everything. It's increased the feeling of loneliness recently, which interestingly I don't experience when I'm actually alone. I've had very strong feelings in the last year or so that I was part of the Sirius story, though much of the karma (like breathing problems) doesn't seem to affect me too much. Another thing that's come up recently is the emotions around not being able to save people/loved ones. I was watching a super hero movie recently and I had to stop it because I was so overcome with emotion, I was bawling my eyes out. The thought kept coming, "I couldn't save them" along with such intense grief. What's motivating you? At the moment it's a sense of re-building. Re-building my life to be more aligned with where we're all at right now. What blockages are coming up? There are strong urges to placate the sense of loneliness by re-entering the dating world. I realise that this is only an outer fix to distract me from the pain, but nevertheless the urge does come up. The other blockage seems to be around finances. I still seem to have a kind of poverty consciousness. Again, it's not always there but rears its head occasionally - particularly when I'm consistently using most of my spare cash on family and don't have anything for myself. What's your orientation in life? At the moment I feel that the breaking down that's needed in order to realign needs to be supported. I feel both on personal levels and local/global ones that this is the case. I feel that I'm able to support this as a natural expression of who I am. From the bottom of my heart, Thank you so much. Your loving and welcoming words were exactly what I needed to hear. I felt your hug and I received it and accepted it. I’m following your journey right now and it’s truly inspiring. I also took myself off meds a couple of years ago after I awakened and I haven’t needed a pill since. It’s amazing how it works. Yes, we do share some similar themes, don’t we? It’s incredible sometimes how accurately we describe each other’s challenges. I wouldn’t be surprised if we eventually find ourselves being from the same Circle of Angels (or witches) Haha! Powerful sharing everyone. I can take something or the other from every response. I do believe Im facing some of the sirius challenges - being not heard in a family strikes a chord. Rich, I believe I have poverty conciousness a great deal. I seem to take some decisions from this sense of lack. And it again creates further lack only disguised in another form. What's motivating you right now? Interestingly I feel a sense of purpose for about a week now. Its really strong that I can take the density with more grace. Sense of purpose can easily be distorted as a sense of control. Especially when I'm trying to go too fast. So I have to stop myself and remind that its not about the outcome. Earlier the joy I derived was mainly from the Ray 2 or the surrendering part of myself which can be content with just sitting in stillness. But now I find a different kind of joy from this purpose even when I'm lost in family density. I have applied for MA in psychology. Thanks Megha for pointing in the right direction. What blockages are coming up? It's mostly uncertainity of how I'm gonna sustain myself withput support from others. A self judgement of being financially depended on my mother from time to time. I didn't think I would go back to the world I came from. But since the decisions landed that I have to live alone and also do the course in psychology Im kind of searching for some job to sustain myself. I went fro this interview and the interviewer said to my face that I'm not at all cut out for a job like this. Tell me something I don't know! On the way back from the techno city, I gave a ride for a guy and had a small conversation with him. This small act of kindness suddenly opened up my heart. That's when I knew how closed it has been until then. Something Anastasia said resonated with me. Being not welcome in a spiritual higher dimensional context. Yes I really feel this, I part with Openhand too. I was with the belief that it has to do with spiritual identities but maybe it goes deeper than this. It's maybe due to this there's an effort for reconnecting with my old self. I'm somewhere in between and none of this is really my home. There's also a reconnection and joy from family. What's your orientation in life? I can't find much difference between question 1 and 3, so I'm gonna leave it that. .I am going into the tightness, which seems to linger and there is a persistent grey energy around. Thank you for the invitation to join. I continue to go within . Hi All and thank you Open for inviting us to join in and participate virtually =). What's motivating me? as in what is engaging you in your relationships, jobs and general living circumstances? I can relate to what Rich shared about re-building. It's been challenging to be in the ashes of a dismantled life and to truly embrace the possibilities within that. There is a longing to give fully - 100% commitment. Something has to give as there is an increasing sense of frustration around getting pulled into the crevasses of ingrained patterns. My children are home sick with stomach pain and I ponder my own sense of "home sickness". There is very much a sense of being disconnected and shut out from benevolent guidance. I realize that this has not been done to me though the feeling is still one of isolation. I feel frustration around not feeling that I can get my feet on the ground and move in any direction. My greatest fear at the moment is to never actualize potential...every day goes by and I am still here in the same energetic space. I am finding it challenging to find focus and commitment. The lower body feels as though it's buried beneath the ground and my upper body is pulling to live, experience, explore. The frustration is gnawing and I tend then toward numbing with distraction. The experience of passing time feels to be a massive pressure. Self-realization - complete surrender and expression of the divine will. Without this sense of purpose, it all feels completely meaningless. I am not saying I am in that place, but that it is this sense that holds even my feelings of disconnection and isolation and moves me to keep on. There are many reflections for me here too, including the hiding, the persecution, and wanting to save others. What came to me today was a song translated from Greek "What begins as nice, ends in pain". I think these words say a lot for me and the "operating system" of my inner child. When I experience something nice, especially something promising to be nice and joyful for the future too, it's like I don't want to invest in that - right from the beginning - because at some point it will come to an end, and it will br painful. Maybe this is related to being abandoned. A dream showed me how a partner abandoned me out of the blue, just walked away. Not a single sign, nothing! Every time you share these treasures, I feel as though I am stepping into a sacred space - so much comes through on many levels. Yes, it truly is amazing how reflective the sharings are...what a gift that is! Interestingly, when I read what you wrote here "I wouldn’t be surprised if we eventually find ourselves being from the same Circle of Angels (or witches) Haha!" I read "witches" as "watchers" and even remembered it that way as I came to write you back here now a little later in the day. I wonder what that's about? There is something for me about watching and now needing to be fully in it, not just watching it. Thanks as always for sharing these deep and soul stirring voyages. Love to you Anastasia! An issue jumped out earlier in the thread here from Rich - about poverty consciousness. Usually this would be due to a trust issue, but in journeying today, a whole new level of it was uncovered and confronted, which was tremendously healing. What I feel to do tomorrow, is to suggest a meditation for you all the explore - inspired by the journey we had. So I felt to leave you with the contemplation of poverty consciousness now, and address it tomorrow with you. We're all pretty pooped here - it was very deep today. So I'll love you and leave you and tune in first thing tomorrow, where I'll share the journey/exploration/meditation. I resonate with your post, especially the part about being abandoned and not being told why. Have had that reflected in my own life as well. For some reason, I became really interested in the Greek song you mentioned. Would you mind sharing it with me if you have access to it? So today, day 3, I felt to invite you all joining to explore into "Poverty Consciousness". Lots of people have it in various ways and it does limit ones ability to manifest a fruitful life - so let's get into it. The usual way spiritual work considers poverty consciousness is that it stems from lack of trust - not believing that your worthy of support by the universe or that the universe will fully support you. This is indeed one central theme. And if such lack of trust hampers you, then I'd encourage you to work to build it first in small ways. Which would be to deviate as much a possible from the usual routines and to "free wheel". Essentially you give yourself a completely open space, relax, meditate and then ask of the Universe, "show me!" You then take off just following the higher knowing and the heartfelt pull. You're watching for "treasure" to appear on your pathway, in terms of signs and synchronicity. The more you do it, the more such treasure appears. You start to embody the feeling of being supported. You can then start to bring more and more of this approach into your life - letting the choices you make come more from this expanded state. If you're prepared to let go of what you think you really 'should' be doing, then the flow will create a more fruitful and abundant experience, including the resources to support your expression. So take an hour or so out today and just free wheel looking for 'treasure' - then do please share here on the forum. But there's still much more to poverty consciousness to explore... It boils down to attachment to old reality constructs, relationships and general living situations - did you really move on? Everything is energy - consciousness, streams of light. And so if you're still bound into your past in some way, if you still haven't fully let go of old reality constructs, then your energy might still be wound up in them. What this means is that you don't have sufficient energy to create future-landing-now. Hence it creates internal confusion, frustration and disatisfaction - the mainstream of your soul is yearning to create a new, feels like it ought to be doing, and yet the new reality or the resources to support it don't seem to manifest properly. It's likely you still have energy hooked into the past, which can lead to lack of trust, doubt and then a general sense of poverty consciousness. It's all about being able to fully let go of the past. Particularly relationships and living circumstances that don't serve. Especially if those relationships relate yo you are you once were, not as you now feel to be. You have to let go, and this might bring up saddness and grief. That's okay. As you confront the grief of letting go, you'll likely go into a sense of loss. But loss is always a doubled sided coin. If you're truly letting go, then the energy of the old construct will come back to you, which can now create in the new way, abundantly and fruitfully. First use the Ascension meditation from earlier in the thread. Get yourself in a deeply relaxed and expanded space. The see yourself travelling through time and space as a small boat. We used this track below by Ashana to create the sense of that. As you journey forwards, look backwards along the stern of your boat and see your energy drifting as streams of light behind you back through the various circumstances of your life. If particular relationships and situations were important to you, then recall those and see the imagery of them. Be clear to feel if they're pulling some way internally. Now feel the energy of them unwinding from the past. Be clear it doesn't serve you as a soul to be bound to anyone, any particular time or circumstance. The soul is meant to be a free flowing stream of light. If others come into your life, they're still meant to be sovereign, whole and complete too. It's all about moving away from co-dependency and therefore limitation. So look deep into these situations and feel the energy unwinding. Be aware that it may generate some grief, and that's entirely okay - but keep going anyway, especially if you want to let go of poverty consciousness. Now see and feel the energy returning to your being. See this energy begin to fill the sails of your sailing boat. Now turn to face forwards. See the energy reaching out into the distance already starting to create a new. All the while, feel the wind gathering in your sails and pushing you along. Afterwards you can express this feeling in movement and dance. Feel the energy building in and around you. Now in your life, watch for the "treasure", where signs and synchronicity are encouraging you, sending love and support, or guidance to take new steps. Celebrate the abundance of this energy around you as it appears. Let trust begin to build that it will carry you and support you in the ways that bring your soul alive. Thus, any sense of poverty consciousness will progressively dissolve. You deserve to live an abundant and fruitful life! This is what we worked on yesterday here in La Palma and it was highly effective. Lots of energy of the past was unwound. What will you experience? Do explore the meditation and share. I very much welcome you all tuning in. And let's be clear, society is literrally awash with resources. There is no reason at all that you shouldn't get all you need to support your authentic and aligned creations. PS - when I have some more time, I'll offer some more personal intuitions and reflections. Indeed, this definetely points to the process of releasing my energy from the past, and that release carrying my energy "coming with the wind", or "riding like wind" to the present (and future!) yes! I did a “free wheeling” like this on Monday. I call it just taking a walk. I had questions and this is how it was presented to me in what I call prime example of questions and answers in unison. Does not always mean I completely understand though what if often means when it happens, but I do my best. I have an idea, I dream of my idea even and most if not all of my dreams that are that vivid come true and yet my idea does not come to fruition in the form of my idea. It is my choice and so I thought to just say hey, are ya with me or not universe. What is the problem, what is in my way. So much came up in my mind that I thought I was just gonna fall down and die for all the floating images and thoughts that came into my head.. But I kept walking and eventually just stopped and sighed while looking down at my feet. What I saw there was 4 four leaf clovers. Reminds me of how much I really love to see people smile when I hand them one. They do exist! Seemingly ordinary little things that are just so extraordinary. I haven't actually picked any for a long time. I usually just smile and carry on, but I picked them for me. Then I proceeded to walk towards my favorite willow tree and as I got there the sun filtered in through the clouds just enough to glint off some shiny metal in the creek that has formed due to rain. There upon the muddy sediment was a quarter, nickle, dime and off to the side a penny. Of course, forty cents plus one. Or four altogether. I wont lie, this made me a bit confused because I was thinking about what I want for me and my life but also knowing and trying to understand what others want from me as well. so I just shook my head and proceed onward. Later on that day a friend of mine stopped by and brought me four huge oranges. She said she just felt like getting them for me when she saw them. So there's my story, my free wheeling/just taking a walk moment. I know what I'm going to do, just going to let it roll!!! Like the ball I found after the clovers that I am reminded of right now as I write this. I just picked it up and let it roll. Awesome song, ride like the wind! I went on a freewalk about a month back and was guided to check out all kinds of clover patches. Was just sure I'd be guided to a 4 leaf clover, but it turned out to be an exercise in trust involving something else. I can only remember finding one 4 leaf clover as kid, and I still remember exactly what it looked like 30 years later. Now I know who's got the inside track on the clover supply. Yesterday was another tremendous day here, that took a whole different turn than expected. After a free and relaxing afternoon break, in the evening the flow guided us to gather in the sauna, which although initially was intended as a light hearted connection, quickly assumed a Sweat Lodge orieintation, that was tremendsouly cathartic and healing. Many deep energies came up, that had me processing the field all through the night. I could feel more of the "Black Snake" energy releasing through the field, through us. Following which, I felt myself becoming as a Blue Sphere with Gaia. In the higher chakras I could clearly feel the embodiment of the 5th density. It was deeply expansive and serene. Sinply beautiful. But in the lower, in my stomach region, I felt the lower densities rumbling away, as if building to some big release. When you feel that kind of empathy, it becomes important to work with it - dance and movement for example, power walking in nature - a deep sense of connection to Gaia and being a part of that strengthening flow. I am feeling a strong dismantling for sure . There have been plenty of tears and even a barrage of anger that I was unable to contain . My husband ,poor guy ,was caught in the crossfire between parts of myself that want to feel safe ,and that want to be in the flow . The spark was the retreat in Brussels . He really wants me not to go ,and I really want to. It was not pretty . Later,whilst doing you yoga I held in my arms all the parts of my sobbing self ,especially the little girl that felt she needed to be someone else - good, efficient ,a great student just to fit in . I am feeling all the self directed anger now as well as all the grief . I am on day 9 of a cleanse and I am seeing how many of my patterns are 'fed' by food ! Feeling very raw today ....and can't comfort my way through food . Wow - well I am surprised to read this sharing as all day yesterday the words and the image of a "blue sphere" were with me...also the words "guardian reformation". Personally I felt incredibly tired and heavy yesterday and through the afternoon, like Megha, there was strong forces of agitation, frustration and anger. I usually am able to contain that, but it was blowing up on those around me (unfortunately). The sense that everything is crowding in around me and I just need some SPACE! The building frustration gives rise to the image of an explosion happening - bursting through constrictions. I was able to take some time out yesterday, jog and be in nature - recalibrate somewhat. The meditation and sharing on poverty consciousness also really struck me and it feels important that I sit with that process - I know I have ties to the old reality that I appear to have shed but have not completely. The ties don't feel as strong as of recently and I feel I can begin to look forward with some conscious release of what's left in the old dynamic. Thanks for the kind words Paul. I definitely have an inside track on the four leaf clovers lol! I hope you find as many as you want! About this dark energy. It can be cruel and so very unkind. I could feel that yesterday when I was just trying to paint. It used to just send me to my knees weeping in how unjust and accusatory the thoughts that come with it are. I bowed my head and just picked up a white towel that was on my workspace and waved it in the air. White flag! I have always and will always absolve to resolve any and all karma therein that I may have. Then I whispered, “this towel I'm holding is from a friend of mine, a sisterhood I have.” There is written upon it a recipe for friendship and that's all I have to offer whether accepted or not. White flag, peace and friendship. It felt to me like it wanted to stick around and try to get me to my knees again, but that's just something I actually cant do right now. So I went back to painting. White flag, peace and happiness to you all! I have been reading and being SO amazed and touched by all the sharings here on this virtual retreat! SO powerful! There are no borders or limits to this MOVEMENT of energy. I know that Open has been intensely processing the lower densities in the field and he will be with us all tomorrow morning. The La Palma retreat is really going deep! and its virtual space equally deeper! So much is moving for us all - Im also in a regression phase myself and its been challenging!! Feelings of grief and reaching a 'dead end point of no return' surface and unfold in waves and keep unfolding. There is a knowing that deeper surrender is invited and this video came up for me with Pat MacCabe, a Navajo & Lakota activist in synchronistic response. When you 'hit the bottom'...pray in the water, the water will listen...just the way you are...just Trust. Or see how it speaks to you! I am right there with you Alex; this is quite the etheric retreat. Jeez Louise there's a lot coming up. The Super Blood Wolf Moon Eclipse deal was not messing around. First off, I had a dream last night that I was doing specific spiritual work with you, Open, and my daughter was with me. But my parents wanted to see her at a specific time, and you had a special meditation you wanted me to do - exactly when I was supposed to drop her off with them. I was feeling massively torn between responsibility to my own child and my own spiritual growth, and that's when I woke up. I completely forgot the dream as the 3D world settled in around me. I completely fell asleep and didn't have much awareness for the entire Ascension meditation. Even though I was sitting with limited back support I still managed to somehow pull this off. I might have been floating with 144,000 angels for a pocket eternity for all I know. BUT when I came out, I was definitely feeling Connected and noticed multiple synchronicities in Nature that aligned with the thoughts and feelings coming through. Following the instructions and settling into the music for the sailing imagery, it took me deep immediately. I was completely alone in space floating slowly through the still darkness in a small rowboat type of ship. I sat up and looked behind at the ship’s wake, which was streaming behind it in a small golden V.
Then I noticed several frozen greyish-white bodies surrounding the boat… and then saw more… and still more of them. And then there were so many they blotted out the entire darkness of space. And some of them, zombie-like with creaky joints and bones, were grasping onto the ship and hanging on. And then I realized… that some of these bodies I knew. They were ghosts of old relationships which had already ended or are drawing to a close. I didn’t want to see but Looked anyway. And their Paths weren’t going where mine was. After the initial shock, waves of grief hit as I experienced heart ripping pain in the left side of my heart space. Then I saw all the past poignant moments of Love and Life within these relationships and it feels like my body is tearing apart from the middle of my chest. The pain in my heart and gut and throat and forehead were unbearable and I’m screaming and calling for help, but I’m all alone in the boat. I resign to my fate and lay down in my boat (in 3D my car seat goes all the way back) to just be in the loneliness and let it wash through me. The sense of responsibility hits that it’s MY fault I’m abandoned and alone. And after an indefinite time, I finally notice another presence. There are two female members of my soul family holding me. I look over to my right and reach out with my hand, and I see my Soul Mate laying in Her boat – and Our boats are going in the same direction. Her hand reaches back out to mine and We are united in Our direction. And my awareness zooms out and I notice then that there are 12 of us, all in our own boats – all streaks of light streaming in unison towards a common destination. Going away from a worn out earth to a new place. And then zooming out further, I saw MANY more subsets of 12 – all of us streaming away from the old construct as sparks of Light. The image of the future I’d always wanted and dreamed of, with my wife, my kids, a house filled with love, beautiful land in communion with the earth, love and family and old age… it is all stripped away and I see the pain and fear in Their eyes. And I grieve for a future I’m afraid I will never know and They will never have. A text comes through in 3D, and it is the Universe letting me know They will be supported in Its own way. Then a single squirrel came and showed off, jumping from tree to tree. I look to my left and the silent blue jay is staring at me again. …And turned facing forwards in my boat and saw the energy I’d gained from my past experiences filling the sail and lighting up my Future. There is nothing in front of me but Light and my boat is streaming towards it, as tears are streaming down my face. Last night I awoke to a different text at 12:55am, from one of my best friends who has been like a brother to me for 25 years. He was letting me know that his Dad had passed away that day. That he just wanted to reach out and share that with me, and that he and his family were OK. I felt a very strong pull to share it with all of my Family here - it gave me a lot of strength and I hope it helps light up all of the 12’s on the Path. Thanks Anastasia, it's nice to know my sharing has been inspiring. I hope you know you are not alone. Although I never considered myself from Sirius, after reading your story and Opens sharing I'm starting to think it's part of my Karma. I've always felt odd and out of place and growing up I suffered from Pneumonia or Bronchitis every year! Definitely something worth exploring in more detail. The group here have come to a great place, having processed loads with energy now turning to the way forwards. So that's what I'd like to encourage in you all now. When you've done a deep degree of processing, it's important to move through and out of it too - to come into a new stability. So when you've come to the bottom of what you've been working with energetically, now it's time to turn your attention to unleashing the new - especially the new aspects of beingness that want to come through. Sit in meditation, relax, breathe, and then begin to regress into the situations that you know are reactive or programmed, where behaviour patterns in relationships or work are limiting or victimising you. You'll know these by the tightness they create - the sense of frustration or limitation. In the imagery see whose involved and what the typical patterns are. Once you've been doing this a little while, feel into the body where the tightness is. The more sensitive you get, you can actually start to feel the patterns in the brain. Once you're feeling the tightness, now start to 'open out through it'. This could be done by visualising something opening - a flower for example or the sun coming up across the ocean. Or you could visualise dissolving the patterns by bringing the heat of the sun to them, or perhaps a cooling breeze blowing through them. Another great way is to put resonant emotive music on and dance or move to opening up, being as naturally expressive as possible. Afterwards, take yourself back into meditation, now viusalise the behaviourisms that tend to take place, and see yourself breaking them, interrupting them and opening a space for more authentic beingness to come through (which I'll go into tomorrow). Here's the essential thing - when those patterns next arise in your life, you have to work to get inside them and interrupt them. To break them down. This may take several or more attempts, but if you're committed, you can do it. To give you an example, I recall in the early days a particular family situation where someone was constantly projecting judgment and negativity on me. They didn't like the changes I'd made in my life and wanted to constrain me in the old reality. So there was a lot of projectional judgment. In the beginning, the natural expression of truth kept arising through me causing me to then challenge their viewpoint. Except that it didn't achieve anything or go anywhere - it simply perpetuated a reinforcing cycle. So I asked the Universe "show me". To which a scene from the matrix came to mind of Neo stopping bullets. I instantly understood that the bullets represented the energy of the person, and that with a determined internal commitment, I could simply stop the 'bullets' and not even need to respond. By interrupting reactionary neural pathways, in the moment they were activating, they quickly broke down, which opened a space for a more auathentic response to come through. In this case, just to listen without even responding. Subsequently this then developed into other authentic responses such as asking the person a question about their energy in the moment, causing them to explore their own old energy. So this is what I would encourage people to explore once the deep processing has integrated - actually interrupting old behaviour patterns so as to allow the new to come through. This is deep alchemy work folks! First of all, I just want to say that I’m utterly amazed at the depth, vulnerability, and sincerity with which everyone is sharing and contributing. And I’ve made a giant leap from feeling unworthy and unwelcome to feeling SO grateful and proud of being a part of the community I’m witnessing right now. Open, you were ‘worried’ you wouldn’t get to save enough souls at the physical retreat, but just look at how many you picked up in the ether! Pure Cosmic Brilliance! There is so much good stuff coming up here at this virtual retreat, so many common threads and themes that I feel I want to respond to all of them, which of course I can’t. This means I have to be selective and it’s taking me through a process of really feeling into what would serve the most, both myself and others. My inquiry finally lands where no one else’s road seems to be headed, at least not at the moment, and that’s my clue as to where I need to go. Into the scariest place, of course. I have to take the road less travelled. I want to talk about the ANNUNAKI. I want to compare and ‘check’ my experiences against yours, Open, as I know you have had your fair share of dealings with them and know them better than anyone. I need to do this, because I sense they are a big part of my history and I need to get to know them and understand them better. However, during her visit, Eden also introduced me to another previously ‘unfamiliar’ energy that almost squeezed the life out of me at one point. I was lying on the couch resting/meditating with Eden next to me. We have really large windows, and from my couch I can see the sky with all of its movements and shifts. At first, the sky was quite clear, but after a few minutes this thick blanket of white clouds suddenly moved in over my head and face. The energy that moved in with these clouds was of a nature I had never experienced before. Suddenly I felt like someone was beginning to suffocate my whole body and being. The energy translated as WHITE or WHITE COAT energy. I checked these terms with Eden several times and she confirmed. It was a highly suppressive energy that moved in slowly but with full force, like a giant mothership that invaded and took over the whole atmosphere around me. Like I said, it was highly suppressive, very synthetic, sterile, and extremely ‘clean’ - disinfected somehow. I couldn’t find or feel anything organic about it. When it overpowered me, I immediately had visions of being in highly sterile environments, like hospitals, laboratories, and institutions with white coats walking around all around me. It was quite similar to the Grey Orion energy, and I asked several times if this was a variant of the Greys, but there were subtle but significant differences that told me otherwise. The colour was definitely not grey, it was WHITE. And it was immensely more powerful than the Grey. While I can feel the grey energy around me sometimes like a grey fog messing with my mind, this white energy literally had me PINNED DOWN on the couch with hardly any freedom to move at all. It was a very disturbing experience, but it was clearly one that Eden was there to show me. In the past few months, since this experience, I’ve had a few more encounters with this energy and I have been given to see certain degrees of my own involvement with ‘them’. It has also become clear to me that I have been on both sides of their spectrum. With them and under them. I also have a very strong empathic connection with the Orions who show up frequently for help to move on. They seem to be attracted to warm and compassionate Motherly energy and they often ask to be held and embraced like children. It seems to be one very effective way for them to find realignment. And a mutually effective way for me to release my energetic ties with them. I understand this might all seem really ‘out there’ to some, but since we’re finally openly talking about Sirius and the events that transpired there, why not also talk about the Annunnaki, who were a huge part of it. Especially since it seems there might be a few of us who actually headed that way… Phew! I think you are all amazing courageous souls, and I dedicate this song to ALL who will venture into the Unknown with Me! Hi Open and All the Wonderful Souls! I have been following the retreat as much as could. I am an interesting quest at the moment. I know it will be challenging and the same time liberating. The theme seems to be - Karma and Acceptance. I have seen enough signs and synchronicities up to now to confirm this. Right now I am sitting in the lobby in front of a huge statue of blue beach sandal standing pointing upwards. Things seem to be upside down. Other things seem to be pointing downwards like lamps and installation of drink glasses. I have been drawn to this place after some freewheeling. There is a group of women gathering around where i sit reading for some kind of party or event. Actually, I am not quite sure why I am writing this here as expressing myself verbally and words has always been a challenge, so is being around group of people where I need to engage. And a group of events i have signed up for is exactly this, this even being one of them. This is challenging as i seem to get lost in the energies. I feel like i have been non accepting of myself because of this, subtle judgements and such. It is interesting that on the day of this trip i have seen interesting signs of the birds. One seemed to have flown itself against a kitchen window while my hair was being cut. Another one (smaller and sings beautifully) somehow gotten inside my office/meditation studio. This is the first time it happened, must have gotten there through the chimney pipe. Very unusual. It pooped everywhere, especially on my laptop. The amazing part is the bird must have knocked down the scrolls from Openhand 5 Gateways retreat 2 years ago and the first word i saw was 'Accepting'. My Higher Self is trying to get through to me! Well, onward with my quest and adventure. Challenges will surely come up but I am ready! Open, do take time to rest while in La Palma! I still miss those coffee places to relax and flow! It's synchronistic that you bring up the subject of the Annunaki here - since they've been responsible for much of the programming that's gone on and people now need to unwind. What you describe does indeed bear some striking resemblances with my experiences of the Annunaki. Although I can recall them also from way back before Sirius where they had a more organic nature - It would be nice to think they are returning to that somewhat now. The Annuaki were the architects of this reality construct humanity is living in - a highly controlled and synthetic system, imposed on the consciousness with highly advanced energtic engineering - particularly of the genetics and creating energy systems to control the earth vibration. They were very much the elites of Sirius and also here on Earth. Mostly they acted from the field and through humans by thought and energy control. And since they are a hive consciousness, it can feel like being consumed within a powerful cloud. But that also makes them brittle - if you don't allow yourself to be overwhelmed by it, but play back the distortion, if you're accurate and it lands, then it immediately ripples through the entire hive. A seed of doubt will unravel their reality. Around 2012, I was acting as a part of the higher dimensional team tasked with connecting with them and journeying with them, eventually regressing them through their story here since Sirius. Their grasp of truth was highly advanced, and many times they attemtpted to bend me to their viewpoint on things - such as the current reality 'healed' for the 'good of all hmans' (but not all sentient life), and still controlled with free energy, geoengineering and the like. They were exceptionally powerful healers, except they took it upon themselves to heal, but missing the crucial self-realisation aspect - so they maintained the patriarchal authority. We were eventually able to regress them through their journey, leading to a full breakdown and realignment. After Sirius they'd felt 'abandoned by God', hence they began to manipulate reality to their own agenda - essentially to recreate the reality the'd lost. To some, like the Orions, they became "God". That's in effect what they created here on Earth today, with their influence stretching into every aspect of society, religion and spirituality - always bending the truth slightly so as to control. During the regression and supported self-realisation, they shifted in consciousness and peeled off the matrix. It was at that point there was a marked and clear opening in the field, prior to which it had felt very much locked down. It's become much easier for souls to break free of the influence now - although of course there are other groups still engaged with whom they were allied - the greys and the reptilians, not to mention the human groups that consciously and unconsciously worked with them. Very powerful. Letting go of the shadow self was exactly what I needed today. I was feeling very down, negative and sad today. Sitting in the breathwork meditation and exploring the shadow self allowed me to isolate the sense of sadness and process it using the bow meditations. After about an hour of processing, I put on some of my favorite Dave Matthews songs and let my lost soul express itself to the music. I now feel lighter, more positive and full of good energy. I just had the most wonderful experience! I started out doing the Ascension meditation and worked my way into the boat visualization. At first I had a hard time seeing the light behind me. I kept looking behind me and nothing was there. I kept breathing and listening to Ashana. Eventually I was able to look behind and see my energy like threads of light. All of the threads were smooth except for one. I've been involved in this convoluted dysfunctional relationship that I've been trying to resolve and break free from for a very long time, too long... This one thread of light was wrapped around this person and as my boat slowly moved forward this energy was wrapped around her as she bounced up and down flailing on the water, holding desperately to my light. The light was wrapped around her in a large ball and it was very distorted and heavy. I kept feeling into it and letting go. Letting go of the need for her attention, the need for us to be together. The more she pulled and grabbed onto the thread of light the more I relaxed and let go. After years (yes years) of trying to break free and letting her hang onto me and drag me down, I was able to finally let go. I regained the light that had been wrapped around her and turned around, placing it into my sails pushing me forward and my boat took off, crashing along the waves. The wind was blowing in my hair as the boat picked up speed. I played Ride Like the Wind, imagining the light that had been wrapped around her filling my sails and pushing me forward. My boat took off in the wind. I was standing on the boat crashing through the waves, moving forward with nothing holding me back. I was dancing like a fool on the boat with nothing holding me back. Walked halfway around the world"
The song starts out slow and as the tempo built I felt this connection to the spirit world open and an outpouring of unconditional love. My soul family on the other side connected with me and told me I was missed, loved and supported. Never alone. The feeling of being loved and supported was overwhelming and I started to cry. I kept saying I waned to go home, I wanted to be with them. "It's not time yet, you have work to do, you're not done yet" was the response I got, followed by more unconditional love. I looked behind me on my boat and all of the strands of light were straight and bouncing on the waves as my boat moved forward with great speed. No more entanglements. I didn't have to wait long for the treasure to appear!! Looking forward to creating my future.. I felt really uplifted after reading your sharing. Amazing - So happy for you! Great call on DMB too - their music provided a lot of the formative soundtrack of my high school years. What you shared moved me greatly which is why I am replying to you directly . When I regressed into the boat visualization I felt a strong impulse to let go of some people in my life including my mom and brother and a friend who is a soul mate. To him I actually apologized and gave a rose as I unwound very heavy dense cords between our hearts .there was lot of grief at that and lots of tears. In my dream I set him free. I saw my now husband in his boat and cheerily waving at me as his boat ran parallel to mine. I then looked back but couldn't make out too many relationships that I was leaking energy into. And then I think I saw Sirius - a massive planet with swirling white clouds. And the word that came to me in a flood of tears was Failure. I had failed there . And I had to let go of that grief . Again I cried and howled at my failure . When I looked in front ,I saw Gaia and then seemed to go into and embody her. Still sitting with that intense experience ! Hi Everyone - great having you tuned in. We're nearing completion here in La Palma. The crew had a wonderfully expansive day yesterday, walking through the Volcano and boat tripping with Pilot Whales. Yet plenty is still shifting and integrating in the background - so much energy moving. In the Volcano we created another portal and felt the presence of different star soul groups coming through. At one point I saw tall shimmering golden beings weaving in and out of the circle - it was simply amazing to feel them. Okay, so you've been doing all the tough work - digging deep and breaking through difficult karmic layers. It's far from easy. My heart goes out to you all There comes a point when you've been through the layers that you reach an appropriate time to pause - to stop digging and begin integrating the new beingness. What we're looking for now, are those nuggets of soul gold that got buried in the sediment of the stream. 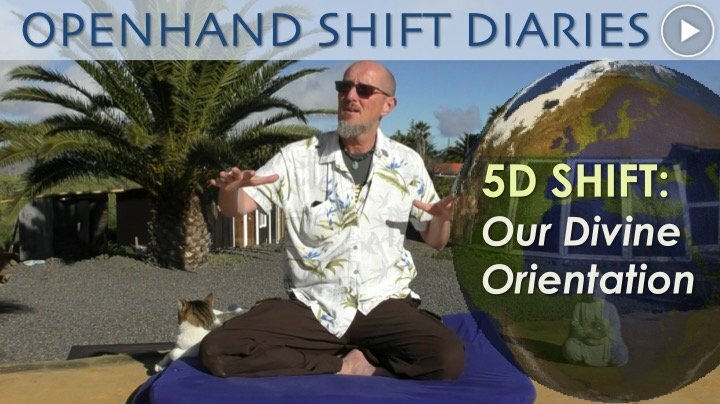 We've stirred up the cursty layers, broken them down and dispatched the density (if you've still more to do on that, think about some of the cleansing breathing exercises like the Openhand Bow or else deep consciousness bodywork). So now it's important to connect with those nuggets of soul that you've dug up. These will be new aspects of beingness that want to come through and express. Maybe more surrendered and accepting, maybe more willful, maybe more creative and magical, maybe more diplomatic and solution resolving. In the Openhand perspective, the soul is comprised of 7 rays of consciousness, each with different qualities and characteristics. When you can allow them to flow through you and radiate outwards, then they'll manifest in the most extraordinary of ways - you're unleashing light into your life, and it draws to you more harmonious, successful and fulfilling circumstances. It's all about letting the light through. To do this is to watch for the emergent light as it wants to come through and fully express it, in whatever way feels appropriate - like moving to your favourite music or connecting out in nature - going to a new place that feel adventurous. All the while embodying what new energy wants to come through. Sometimes this energy will be subtle and start with just a gentle vibration. I can recall being so surrendered during an attack once that with each new projection, the surrender deepened into a complete state of bliss. But it only began in the subtlest of ways. Ray 1: purposeful creative will (The "Leader") Ray 1 is the driving sense of purpose to create. It is the manifestation of the divine masculine principle throughout the universe. From the place of separation, it is that undeniable inner will to find and create a higher level of harmony both within ourselves and between all sentient beings. It causes us to challenge and break apart the status quo which may be holding us in a lower level of realisation. The Ray 1 inspires life’s motivational leaders. Ray 2: surrendering unconditional love (The "Servant") Ray 2 initiates the impulse of unconditional love for life. It is the manifestation of the divinely feminine principle of surrendered acceptance throughout the universe. It is the empathising compassion that willingly embraces, does not judge nor need to change the inherent imperfection in all sentient life and situations. Ray 2 strongly inspires the selfless servants of life. Ray 3: interpreting authentic reality (The "Interpreter") Ray 3 harnesses and processes higher abstract wisdom delivering it in a form to provide a clear interpretation of our current, authentic reality. In other words, it’s how we know what’s really real. People with strong Ray 3 influence notice the natural patterning in life bringing the formless into form in such a way that can be understood and appreciated by many. Ray 3 inspires life’s translators, creative artists and mathematicians. Ray 4: harmonising through right resolution (The "Diplomat") Ray 4 is the divine rationalising energy which helps us find right resolution with our environment and other sentient life. It is the ray impulse which blends passion with compassion. It provides the discernment to confront unjust situations in a non judgmental way. Its purpose is to break apart the lower harmony to find a more equitable higher one. People with highly active Ray 4 tend to be life’s diplomats, politicians and teachers. Ray 5: realising abstract higher wisdom (The "Scientist") The Ray 5 enables us to hold the infinite complexities of the universe as pure knowing within our beingness. This ‘science’ is abstract, all encompassing and rather than realised, is more sensed, as an art form, like poetry in perpetual motion. Ray 5 enables us to attune to the universal flow and harness it for co-creative exploration, deeper understanding and further evolution. The Ray 5 animates life’s scientists and creative business leaders. Ray 6: yearning self expression (The "Idealist") Ray 6 inspires us stay continually focussed on our life’s purpose: to realise, unfold and express who we really are. It generates commitment and devotion to our cause, radiating our soul in all its brilliant colour. The Ray 6 provides the unquenchable driving force to express our innate qualities and inspire others to shine their inner light too. Humanity’s philosophers, spiritual leaders and performing artists are all driven by the Ray 6 influence. Ray 7: shaping synchronistic magic (The "Magician") Ray 7 provides the ingredient of pure magic on our life’s journey. If we are able to master our inner distortions and pause just long enough in the drama of life, then we can open up to spontaneous, synchronistic and co-creative magic. Thereby we catalyse and initiate the surrounding field for the maximum benefit and upliftment of all. In this way, Ray 7 inspires life’s ‘magicians’ and entrepreneurs. So what we do at this stage of the work, is look for characteristics like these, but crucially expressed in your own unique way - that might begin as a subtle feeling that wants to build. The important thing is then to open the space for that new consciousness to come through into your daily life. Let your true colours shine through - they are beautiful, like a rainbow! what a powerful story. I thank you so much for sharing it. For weeks now, I've been feeling lost. In my current life it has to do with the fact that I have sold my house and am looking for a new home. On a deeper level I feel that it is related to an experience from a previous life. In addition, I have felt desperate since last week. Nothing made more joy, everything became too much and I fell back into very old behavior patterns. My thought was that it had to do with the moon. But I could not classify it. It came to me the idea to visit the Openhand page and I came with the explanations about the moon from Open. That showed me that I was on the right track. And then I read your message. It completely knocked me out. This feeling of loss, lostness and not belonging. I sat crying at my desk in the office because your story touched me so deeply. And I thank you from the bottom of my heart for having the courage to overcome your fears and share this story. There comes a hunch that I too have lost my family, perhaps my soul family. The feeling of sadness and loss was so strong that it pulled the floor away from under my feet. Through the "Ascension Meditation" I have fortunately regained a small piece on which I now stand. This piece carries me and here I feel safe for now. I thank you so much. And also a lot of thanks to you, Open. Indeed a good deal of souls here who are star souls feel the loss of soul family which is often expressed as losing the sense of home, belonging or of not fitting in. That connection can be difficult here in this density. The key is to work to open up to the higher vibrations through meditation, like the ones we experienced in the work, and you'll start to pick up and integrate the feelings as an inner vibration until home starts to reside in you. I would say as you do this more, then the physical home will manifest. I here you're coming to the 5GATEWAYS "Living the Shift" gathering in Belgium - wonderful, that's just what the course is all about - how to embody higher dimensional expansion to manifest more from 5D here and now. We'll have a wonderful time for sure. Marvellous Breathroughs - "Lights will guide you home!" Greetings to All. The retreat here has ended now in La Palma - we dropped the group off at the airport around lunch time. It's been a powerful week. As I felt would be the case, because the group size was smaller, we went even deeper. There have been some marvellous breakthroughs. And it's clearly being reflected by what's going on in the virtual community - what a tremendous connection. So heart warming. And so inspirational to see you all confronting the density and working right in there. Just keep going, keep pushing, keep inquiring, keep unwinding. You'll find the light deeper still and it'll integrate through you. Hi Everyone - it feels like it's been a tremendous success, both running the retreat here in La Palma and have you join in with some of the explorations across the web. I feel there have been some great inquiries going on, lots of inner confrontations and some wonderful breakthroughs - it's been deeply inspiring. I felt to close today by returning right back to one of the opening questions our retreat began with.... "What is Your Orientation in Life?" Of course the question is quite open to your own interpretation, and it felt important for it to be that way, so as to encourage an exploration of what actually motivates you on a day to day basis. And most importantly, "where do you come from?" What I mean about "where do you come from", is where does your expression of self come from in any given situation? Most people are in a very reactionary pre-programmed state - they get up in the morning, repeat patterns they did yesterday and the day before, then slip into routines of expectation. In this kind of state, people are coming much more from the identity, which is owned within the system, and they don't really get that living sense of deepened divine freedom. The Orientation I'm inviting, is instead to be continually softening and deepening into your deepest core of being. To get to know what this hallowed space feels like, how do you perceive it? Usually it comes with a great sense of well-being, expansion, timelessness, deep peace, and at times bliss. Although it can strengthen and wane throughout the day as activity merges from and upon it (like waves on an ocean), the key is to always work to be coming from this place, for it to be the background state, the canvass upon which the daily picture of life is painted. The kinds of meditations we've been conducting here during the retreat, and regularly on the site, are designed to both take you into this state, and to come from it more in life. So the regular practice of Breakthrough Breathing, which is essentially a modern day version of ancient pranic breathing, is designed to help you access this divine core of being and orientate yourself so you can keep coming from this. The Openhand Bow will also support the opening, especially if you've already been experiencing density or feel stuck in it. But of course it doesn't end there. When you're touching the deep state of core beingness to some degree, then the soul will naturally flow from there - you're unique expression of your core being which dances and flows with a spectrum of characteristics depending on the landscape it's flowing into - basically the siutations in your daily life. It's of course completely magical as you set the soul free in this way. And you can facilitate more of this free flow of soul through chakra opening and attunement meditations. Bascially a chakra is a consciousness exchange point that allows your soul to flow through a particular density of being - say the physical or emotional or lower mind for example. So that's why I encourage the regular (ideally daily) practice of Chakra opening and Attunement. As you do this though, be mindful that there will be plenty of places where the soul gets fragmented or 'stuck' within certain exchanges. Where you might touch on a sense of guilt or worthlessness for example. You've set the soul free, and now it's going to explore upto and into the boundaries of its own limitations - that's what the light of the soul does. But instead of ignoring, placating or burying this pain, we need to turn right into it and work with it just as soon as practicable. Ideally in the moment. But if not, then a short while later (at the latest the end of the day). For this you can use the Breakthrough Approach, which is to honour the truth of what to place, to express the tightness, but then to soften right into and through it with acceptance. You explore deeply into what was the attached need or what expression were you resisting? You work to touch once more the deep state of core beingness in it - that which doesn't need an outcome, or doens't even need the problem to go away. At the point you're so accepting of it, you'll already starting to open out back into the deep state of core being once more. That's not the end of the story though. Because at this point, it becomes possible to integrate fragments of soul that were stuck in the drama. This part is essential for two main reasons: (1) it stops you having to keep repeating the same circumstances and recreating them! (2) you unleash new aspects of beingness which not only feel amazing, but unleash new creative expression into your life which then shapes life in unimaginable and profound ways. This final aspect then, is to be looking for, and feeling, a new sense of expression wanting to come through - as I outlined in the 7 rays above. These become the keys to new doorways of possibility. So finally today, and for as much time in the days ahead you can commit to it, I would encourage you to spend time both deepening through breathing into your deep state core being, and also then taking off free-wheeling from this place. Simply set some time aside to be by yourself and speak out to the Universe, "Show Me!" Watch where the flow then wants to move you. It will either come as the flash landing of a higher knowing - a vision for example, or a pull through the heart to take off in a particular way. Then simply witness what you come to explore. What is your attention drawn to? Most importantly, explore how what you see makes you feel. To give you an example, last night after I'd dropped the group off, I was feeling how best to relax and integrate after the work. A flash of inspiration came to go down to the beach. I found myself stretched out on the sand, watching the breaking rollers come in, clouds dancing across the sky and the orange red sun going down, all to my favourite music. I could feel the deep sense of peace at the core of everything, but with life dancing across the canvass. I was there for ages, it was simply divine. Which Ray likes things clean and orderly cause that’s whats manifested for me! I just spent the morning cleaning my apartment from top to bottom! My usual cleaning is a room at a time and a weekly dusting and vacuuming. This was a top to bottom, clean every room including mopping and scrubbing the kitchen and baths. While my soul typically leads the Oscar Madison lifestyle (though not as dirty and I don’t leave food around! ), the Felix Unger aspect of my soul is definitely front and present right now and wants his living environment clean and tidy even though we are moving in 7 weeks! Its cold and rainy here in Tampa today so I’m not sure I’ll get any free wheeling in, but I’m looking forward to exploring it during the week. I’ll be sure to share what comes up. Thank you so much for manifesting the virtual retreat this week, I found it very impactful and I still have a couple of meditations to work through. I’m so deeply touched by your sharing. Thank you for opening your heart so generously. I want to give you a hug so badly and I’m so glad to see that I will have my chance in Belgium at the Easter retreat 😊. In the meantime, I want to give you this song from our favourite Eurovision Song Contest 😉. You have done such a tremendous job this week for all of us. I’m amazed how you can hold and handle so many processes at the same time. I think the resonance of this week will echo far and wide for a long time to come. Thank you so much for this sweetest of (RE)TREATS! Your answer warms my heart. Thank you so much. I send you a virtual hug. I'm looking forward to Belgium when we meet again. Yes, like the Phoenix we stand up again and again and continue on our way. Every time I hear this song, it touches my heart. That gives courage. Tomorrow morning I will start with the breakthroug breathing. Hi Dagmar - yes do enjoy the Breakthrough Breathing - when practiced consistently on a daily basis, it's sure to support lovely expansions - and see you in Belgium! Retreat wrap up - your questions and observations? Phew - what a great week that was all round. I'll definitely be repeating the Virtual Retreat concept again in the future - although next time I feel to develop it as a standalone and more formalised with live video input. I'll be sitting with that and letting it manifest in the time ahead. 1) Do you have any final qusestions? 2) Any observations you'd like to share? 3) Sit for a while and then contemplate, what are the key things you'll take from the week? PS - if you share things out in the open this way, it gives energy to your new realisations and helps them grow. The passed week was a big turning point in my life. While following and being present with the La Palma virtual retreat, I was involved with the local event engaging with a group of beautiful souls coming together to catalyze and be the Change in the Consciesness Shift. It was a great opportunity for me to connect with others out there. It was certainly a challenge for me to out in the open like that and I went through this, got plenty of reflections and learning. The biggest challenge was to remain true to Myself, even when it has to rock a boat so to speak. Actually, it wasn't that scary to be authentic and people appreciated it. It served both ways. I now see more possibilities to engage locally and be of service myself and others. I was able to give my first two formal facilitation sessions. Yay! I am grateful for that! Phew that was powerful ! I am still processing a lot since the virtual retreat after going into a lot in the last few days. I have been aware that I had poverty consciousness for a long time . The explanation that it's ' lack of trust in the Universe 'never really resonated with me because I like to think I am extremely trusting . And yet I could often discern a lack in my thoughts . After the visualization ,I was guided to see how I hide my truth to fit into the construct of my marriage . It has been a hard few days while I have processed and tried to soften into the deep resistence I feel . I have as Open describes it either capitulated ( passivity ) or gone the opposite route and straight up rebelled when there has been a significant difference of opinion. This time ,with some effort I have let things just be in a mess between us rather than be in a rush to resolve by using either of the strategies . I feel that the breaking off old ties has greatly helped me in this regard . Synchronously today ,as I was sitting with and trying my best to be one with the feelings ,I attended a meeting to contribute stories to three books all that have really groundbreaking content . Thank you so much for the virtual hand holding . It has taken me deeper for sure ! either capitulated ( passivity ) or gone the opposite route and straight up rebelled when there has been a significant difference of opinion. This time ,with some effort I have let things just be in a mess between us rather than be in a rush to resolve by using either of the strategies. A more powerful controlling person could control your physicality and limit you that way. However, it is only ever our choose as to whether we feel powerless at a soul level - whether we retract from the situation. Sorry for the slowness in reply time from me. It’s my last week at the office and it’s almost comical the amount of complexity and “time intensive” projects the matrix is throwing my way on my way out. When I read that word “FAILURE,” it briefly let me touch on an undercurrent of intensely focused, seething anger that won’t quite allow itself to be seen Yet. I must have “failed” there too; in a pretty spectacular way. It feels like I could explode from the inside out. Which ray is clean and orderly? Hi Scott - I missed one of your earlier posts - which ray is clean and orderly? I would say the orderlyness is related to the scientist - the ray 5. And there could be an element of the diplomat in there - the ray 4 - wanting the field to come to an orderly resolution. Although I've separated out the rays to give clarity to each, then do also work in harmonies. So the universe communicates to me thru my scale. Typically when my weight is exactly the same (to the 1/10th of a pound!) for 3 days in a row there is a message for me in the numbers. Typically I reduce my weight to a single digit and that’s the angel communicating with me. I never thought it was which soul ray was trying to break through!! Ray 5 has definitely been breaking through the past few months as the pure knowings have been dropping like bricks! Hi Scott - sounds like the ray 5 is for you right now! But also check out the ray 3 - the interpreter. Feels like to me that more more might represent the orederlyness. New video diary featuring "Mr Tibbs" the affectionate cat! I can already feel it - 2020 will be an auspicious year in the shift - the year of The Divine Being. I was so thrilled by the energy of our venue this year on La Palma, and of the previous years, that I felt to go ahead and book Januray 2020 right now. And I can also feel a Virtual Retreat of its own taking shape for the beginning of January 2020. In this great unfolding shift, let's stay connected! After coming back from La Palma last week, I have been wanting to post something here in this wonderful virtual retreat thread, which I only read after the physical retreat finished. Yet there has constantly been a reason/resistance not to and even as I sit here to write, I am having to work my way through strong yawning/purging air coming up when attempting to write. I guess it is all somehow related to the main theme that was creeping up during the retreat for me, namely the games going on in my mind and also the relation to my physical body. The retreat was wonderful, but for me definitely the most challenging Openhand retreat so far and one where I have felt least uplifted at the end of it and still now life feels very grinding. So mind games…. I was able to somehow become more aware of how and when they are happening internally and particularly where interference seems to be coming into play, yet I don’t feel I have fully managed to pierce through it and still find myself getting stuck in them over and over again. And somehow the awareness makes it more frustrating than before when it would just be happening and I didn’t know better. How do these mind games really work …., something I am still trying to get a grasp on. There were several mechanisms that I was able to identify during the week. One of them being that during the sessions I from time to time experience very strong energies that feel a bit like an exploding firework factory internally. So there is an urge to just let rip and entertain the explosion with some noise and physical movement, but at the same time there is the discernment that perhaps it is better not to do so right in the middle of something Open is sharing to the group. Hence I contain (which feels controlling) the energy inside, which can feel quite unpleasant, and where usually a ‘rebellious’ aspect tends to come in, which starts to encourage letting the explosion out regardless of the circumstances. I have been finding it hard to feel, which is the more authentic pull in this and where exactly the interference comes in. The other mechanism I observed is one around distraction and getting pulled into my head. For example, when there was chatter going on around me, I easily get distracted and my attention drawn to it and every attempt to bring my attention down into my body would result in a very strong tightening on the right side of my head, which very much felt like an interference trying to keep me stuck in my mind. The tightness on the right side of my head in itself was actually like a distraction and the more I would try to move away from it, the tighter and uncomfortable it would get. A few times it would actually stop me from being able to concentrate on some of the exercises we were doing, leaving me feeling tight, frustrated and pissed off at the end of it, when the rest of the group would be feeling expanded and light. Contemplating on this one since, I am still finding it hard to see how to ‘become one’ with this one, because when I try to bring my attention away from my head, the tightness in my head seems to strengthen, pulling all my attention back to my head, yet when I move fully into the tightness in my head, it somehow feels like it is exactly feeding the mind games in there. Since coming back from La Palma, I have been pondering a lot on these mind games… I mean I have always known that I have a strong mind, which is to a certain extent a conditioning from growing up, to approach life mostly from the head, but I had never before been able to witness these games from ‘a distance’ so clearly and also feel at which point some kind of interference seems to be creeping in. And how these mind games very often stop me from doing things, even from posting here! My mind somehow seems to have some interesting ‘control’ on my body and the ability to create physical tightness for not playing along with the games. Still this week I am experiencing lots of headaches and tightness on the right side of my head and finding it hard to know how to deal with it all. There are moments I wish I could just chop my head off to make it stop! I would like to conclude with thanking of all of those who were checking in virtually with the retreat here for being there with us and all your great sharings here. And Open thanks so much for the video! Lying up there after the sauna gazing at the stars was definitely one of the most memorable moments of the retreat for me! And I think the affectionate Mr. Tibbs might be the same cat I saw with a dead pigeon in his mouth last week. I guess even cats have different sides to them! Imagine just after writing this, there is a pigeon peeping his head around my balcony window right in front of me and has been hanging around with some other pigeon friends (at some point there were 3!) while I have been writing this message. Where do you feel the fear of loss of control? I think you articulate well what many people experience - particularly those with strong intellect capabilities. The mind creates various cycles and loops of activity, which kind of work in society, but when you start to break free, as you are, they all tend to surface. And sometimes they tend to compete with each other. There's the questioner for example, or the rebel, or else that which needs to be engaged in the control loops. The key is to identify what the 'tightness' is and in the Openhand way, express into it. It's not always immediately obvious to see what the tightness is. In this case you might feel it in the mind, but my sense is the underlying tightness exists elsewhere for which the mind loops are a cover. I sense that really the tightness is deeper down in the body, through other chakras. If you were to imagine completely losing control, how would that feel? What fears would come up? I would suggest exploring into this and seeing where that takes you - where do you feel the fear of loss of control? My sense is that this would point to the source tightness. Thanks for your feedback on my post and your suggestion about exploring the fear of losing control, which definitely stirs something inside. I have been trying to feel into it and what seems to come up is something about death/disintegration and being labeled as mad as a justification for others controlling, institutionalizing me. So there seems to be something about maintaining control to make sure I don’t ‘step out of ordinary’ and the consequences that that could have. Interestingly what was coming up in relation to the madness was something about having my children being taken away from me (must be karmic then) by others for going mad/losing control, feeling particularly the grief associated with that. I can feel there is more to explore here, not an easy territory…. Deep layer of karma - keep digging! Well it definitely sounds like you're tapping into a deep layer of karma - which is a good sign, because that means you're accessing the source pain. So the potential for a productive shift is there. My encouragement is to keep digging and unwinding. It's sure to bear fruit.